Announcement The Canada Post strike has ended but some parcels are still being delayed! Please be patient while our postal workers work through the backlog. 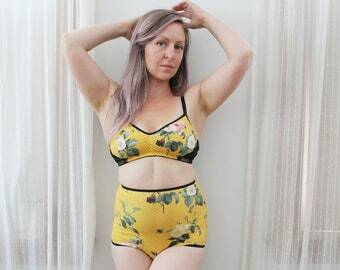 Handmade Lingerie in unexpected prints & fabrics. Every garment is cut, sewn, customized and packaged by designer, Sarah Norwood. Please allow 4-8 weeks + shipping for LINGERIE and 3-5 business days + shipping for SLEEP MASKS. The Canada Post strike has ended but some parcels are still being delayed! Please be patient while our postal workers work through the backlog. Witchy 'Familiar' Charcoal Peach and White Kitty Cat Silhouette Bralette Vintage Style Handmade for You! Received quickly on other side of Canada. Stunning colour. Feels like a dream. 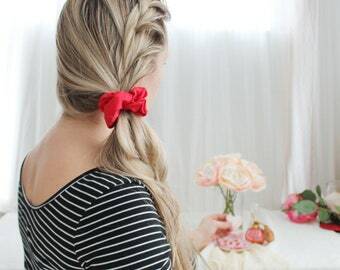 The perfect hair accessory. Thank you! 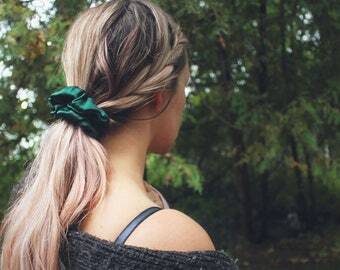 I’ve been hoarding scrunchies and this one is by far the most lux one I own. Beautiful and so gentle on my hair. Beautifully constructed. Very cute and fits like a glove. You can tell a lot of time and love went into making the piece. Thank you so much, Sarah! Will be buying more sets in the future. 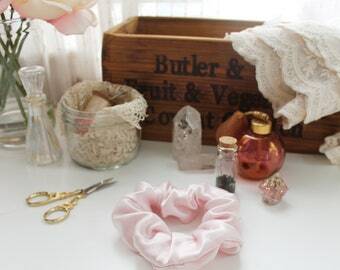 Get a pretty handmade lace pouch with any scrunchie purchase! From April 19-22, sleep masks ship for free! For the longest life, hand wash (or at least machine wash in cold) your lacy lingerie. Always air dry. Heat from the dryer can damage elastics and lace. Hello! Thank you for visiting my About Me Page. My name is Sarah, and I am the designer maker behind Ohhh Lulu Lingerie & Apparel. I started Ohhh Lulu in the fall of 2010. After graduating from the Fashion Techniques and Design program from George Brown College in Toronto, ON, I moved from job to job until I finally settled for an administrative position back in my small home town of Orillia, Ontario Canada. 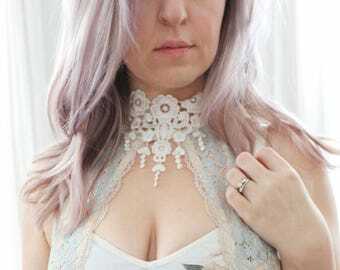 Sewing lingerie was a creative outlet for me and was the perfect way for me to incorporate my love for delicate fabrics, feminine print, and vintage patterns all into one garment. What started as a hobby soon grew into a flourishing business, and I now run Ohhh Lulu full time from my new (old) home. Each piece is carefully cut, crafted, and packaged by the designer - Me! When I am not sewing, you can find me fixing up my old house with my husband, Daniel, or roaming around my beautiful home town with my pug, Oliver. If you'd like to learn a little more about me, my process, and what I do, check out my website, www.ohhhlulu.com. Hi! My name is Sarah, and I am the owner/maker/designer behind Ohhh Lulu Lingerie & Apparel. I live in the loveliest little town edging on the Muskokas in Ontario, with my husband, my pug Oliver, and my new kitty Lydia. For best results, always hand wash your lingerie in cold water. However, most items (excluding sequin and lace items) may be machine washed on a delicate cycle in cold water. Do not put lace or sequin lingerie in the dryer! Sleep masks can be machine washed and tumbled dry. With the exception of yearly Sample Sale items, all lingerie and sleep masks are handmade just for you! Due to the handmade, customizable nature of my items, please allow 6-8 weeks production time plus shipping. All orders come tastefully wrapped and packaged. Perfect for gifting! Please also feel free to leave me your exact measurements. All items are handmade to order, which means I can customize the fit just for you! Please measure and select sizes carefully.